In this exercise, you will begin with the table of addresses that you geocoded in the Geocode a table of addresses tutorial, and you will rematch the unmatched addresses in the resulting feature class. 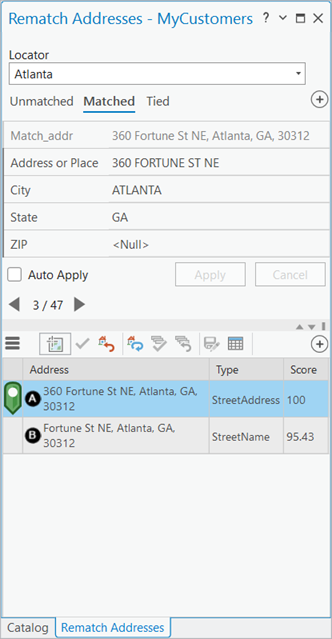 Complete the steps in the Geocode a table of addresses tutorial so that you have the Atlanta geocoded feature class in your Contents pane. Use the feature class that resulted from using the Atlanta locator, not the ArcGIS Online World Geocoding Service. Alternatively, if you already completed that tutorial and have the geocoded feature class saved, you can add a connection to the data and add it to a new project. Right-click the geocoded results layer in the Contents pane and click Data > Rematch Addresses in the drop-down list. The Rematch Addresses pane opens. The Rematch Addresses pane displays all the records in the geocoded feature class singly in the pane in three categories: Matched, Unmatched, and Tied. You can browse through each record individually, and as you match or unmatch addresses, the records update and move to the appropriate category. The pane opens to Unmatched addresses by default, which for this tutorial should contain three records. Sometimes an address is not matched because a perfect match cannot be found but there are close match candidates. The candidates display in list format on the lower portion of the Rematch Addresses pane for the active record being examined. The candidates also display as points on the map. Edit fields to find a better match, and choose a match from the candidate list. For the first unmatched address, notice that there are no candidates found. If you look at the input address fields in the upper portion of the Rematch Addresses pane, you will see that all of the fields that appear by default are marked <Null> with the exception of IN_Street, which contains the address 101 BAKER ST NW. You can fill in the missing fields to discover if the locator you used for geocoding can find any candidates. Make sure that the Auto Apply check box is checked (it should be checked automatically). This will ensure that new candidates are searched for as soon as you update the fields and press Enter. Fill in the IN_City field with ATLANTA and the IN_State field with GA (since all of the addresses you are geocoding in this exercise are in Atlanta, this is accurate). As you change both fields, press Enter after each. You now have four possible candidates to choose a match from, two of which have been designated with a score of 100. Click the Menu button , and click Map All Suggestions from the drop-down menu to see all candidates' locations on the map. All candidates are displayed within the extent of the map as gold icons with lettered representations corresponding to those in the list on the Rematch Addresses pane. Click through the candidates on the list. As you click each one, the map zooms to the selected candidate, and the icon of the selected candidate on the map changes to an aqua color. Select the second candidate in the list, and click Match . The candidate automatically moves to the Matched category on the Rematch pane, and the current view updates to display the second unmatched address from your geocoded feature class, which is now one of only two unmatched addresses. Use Pick from Map to match an address to a location on the map. For the second unmatched candidate, notice that no candidates have been found even though the inputs contain an address, state, and ZIP Code. In this case, the locator may not be able to match this address, but by using Pick from Map , you can manually select a match. Click the Locate button on the Map tab at the top of your project. If you were familiar with the Atlanta area, you could scan the map to find the appropriate street and select an approximate match based on street number. In this case, to get a more accurate match, the Locate pane is a better option. Begin typing the search address, 4505 BEVERLY RD NE, GA, 30309 in the search box. You should only have to type to the end of the street name before a suitable suggestion appears: 4505 Beverly Rd NE, Atlanta, Georgia, USA. Click that suggestion, and you will see two candidates listed in the Locate pane. Right-click the first candidate, and click Zoom To from the drop-down menu. Note the location of the marker on the map, and navigate back to the Rematch pane. Click Pick from Map , and then click on the map in the same location you noted from the previous step. A new address candidate appears in the lower portion of the Rematch pane, containing latitude and longitude coordinates for the point you clicked and designated with a symbol marked PP, which stands for picked by point. The candidate is automatically moved to the Matched category in the Rematch pane, and the current view is updated to display the last unmatched address from your geocoded feature class, which is now the only unmatched address. Repeat this workflow to pick a match from the map for the final unmatched address. Once you click Match , the Unmatched category is removed from the Rematch pane, and your view changes to the addresses in your geocoded feature class that are matched. Click through the matched addresses to examine them. Note that address 2 of 49 is the first address you matched manually in this tutorial and that addresses 38 and 44 are the addresses you matched by picking points on the map. Click the Tied tab in the Rematch pane. You should have one tied address. Select the second candidate in the list in the lower portion of the pane, and click Match . The Tied and Unmatched tabs should have disappeared, and you should see only matched addresses (a total of 50) in the Rematch pane. Save your edits by clicking the Save Edits button in the Rematch pane. Close the Rematch pane, and exit ArcGIS Pro.